Another successful year of the Flights of Fantasy Reading Challenge has gone by and we couldn't be happier. Thank you to everyone who joined not only the challenge but the book club portion of it too! As always, it was a lot of fun seeing people reach their goals and discovering new fantasy authors along with us. And in case you were wondering, I totally met my goal and surpassed it. I set out to read 35 but ended up reading 50! Plus there's still a few more weeks to go so I will definitely be adding more fantasy books to my list. 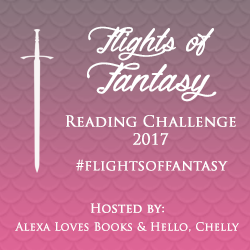 Alexa of Alexa Loves Books & I will be hosting the Flights of Fantasy Reading Challenge again in 2017! We hope all fantasy readers - whether you're a newbie or a veteran - will be joining us, and we promise that, as with last year, things will be real simple. The challenge will run from January 1-December 31, 2017. We're continuing the Flights of Fantasy Book Club (FOF Book Club for short) but we realized that we needed to take a simpler approach. In other words, we'll be reading a book by a new-to-us fantasy author together per quarter. We'll announce the book at the beginning of each quarter and post our discussions at the end of it. Now, for my personal goal, I'm making it a point to read 35 fantasy books next year! I know it's a goal I can reach but as always, I'll try to surpass it. And that's really all you need to know about the Flights of Fantasy Reading Challenge. Simple, right? We certainly hope you'll be joining us in indulging your love of fantasy reads in 2017! If you have any questions, feel free to leave them in the comments section or tweet either of us directly. I'm excited to participate once again!! I wanna participate! This is my blog http://yuxiis.blogspot.com.es/, I think I'm gonna make a post.